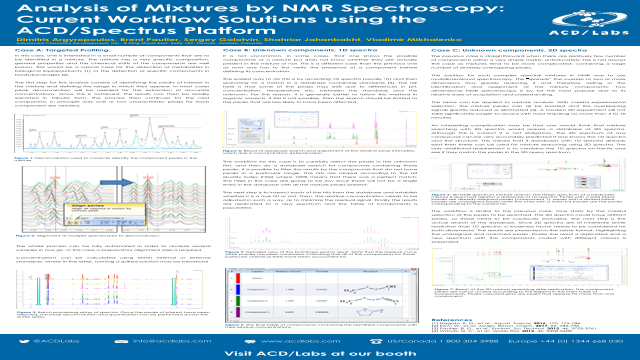 Abstract: Three cases of mixture analysis by NMR spectroscopy are presented with their respective description of workflow solutions using the ACD/Spectrus platform. Nagato, E. G., et al., Aquat. Toxicol. 2016, 170, 175-186. Kew, W., et al., Magn. Reson. Chem. 2017, 55, 785-796. Pautler, B. G., et al., Environ. Sci. Technol. 2012, 46, 3753-3761.